Made from cold cast resin with a hand painted faux stone finish, this Set of 6 Miniature Dragons is perfect for starting a collection or using as themed party favors. Tallest measures 4 inches. Lazily emerging from its egg comes this Green Dragon Hatchling. Made from cold cast resin with hand painted details, this sculpture measures 3.25 x 3.25 x 3.75. Already curious about the world around, this Pink Dragon Hatchling slowly rises from its egg. Made from cold cast resin with hand painted details, this hatchling measures 3.25 x 3.25 x 3.5 inches. 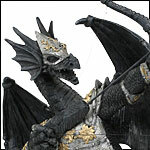 This Guardian Dragon with Sword Statue is made from cold cast resin with a hand applied faux stone finish. Measures approximately 3.5 x 2.75 x 5.5 inches.